The Texas Chainsaw Massacre 2 (also known as The Texas Chainsaw Massacre Part 2) is a 1986 American horror dark comedy slasher film, directed by Tobe Hooper. It is a sequel to the 1974 horror classic The Texas Chain Saw Massacre, also directed and co-written by Hooper. It was written by L. M. Kit Carson and produced by Carson, Yoram Globus, Menahem Golan and Hooper. 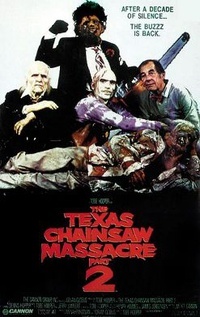 The film stars Dennis Hopper as "Lefty", Caroline Williams as "Stretch", Bill Johnson as "Leatherface", Bill Moseley as "Chop Top" and Jim Siedow, who reprises the role of "The Cook". The sequel was highly criticized by some for its stylistic departure from the first film, including its bigger budget and emphasis on gore and wacky black comedy, as opposed to the original which utilized minimal gore, a low-budget vérité style and atmosphere to build tension and fear. The emphasis was on black comedy, which director Tobe Hooper believed was present in the first film, but unacknowledged by viewers because of its realistic and shocking content. Despite being successful in its initial 1986 theatrical run, the film failed to make a substantial profit for the studio; however, it eventually garnered a cult following and became popular on home video, which led to a special edition release of the film on DVD in 2006. This webpage uses material from the Wikipedia article "The_Texas_Chainsaw_Massacre_2" and is licensed under the GNU Free Documentation License. Reality TV World is not responsible for any errors or omissions the Wikipedia article may contain.